Our summer staff do amazing things! Recently, Ben Blum-Smith was named to the Spring 2018 class of TED Residents, which is a chance for big thinkers to workshop and share their big ideas with others. Representation matters a tremendous amount to me and seeing people like me, as well as people from diverse backgrounds, was inspiring. I heard ideas on topics that matter to me, like an imbalance of resources to people of lower income as well as other amazing ideas that I haven’t thought much about. Ben: keep up the incredible work! Thanks so much for inviting BEAM students along for the ride. PS: Keep an eye on the Museum of Mathematics' YouTube page for a link to Ben's longer Math Encounters. Ben Blum-Smith is a teacher and mathematician who is exploring the interface between math and democracy. He also works to broaden access to the field, through organizations such as the Bridge to Enter Advanced Mathematics and the Bard Prison Initiative. BEAM 2016 is nearly here! As the first step toward the summer, we invite 7th graders and their families to come, eat pizza, and meet BEAM alumni and parents. Jennora, who attended in 2015, thanked BEAM for support in applying to high school and summer programs. This summer, she will be attending GOALS for Girls at the Intrepid Museum. In the fall, she will be heading to Bard High School Early College. Mona, who attended in 2013, announced that she is spending her summer interning at Morgan Stanley working with their technology team. She credited BEAM with giving her the courage to introduce herself to an Assistant Principal at the high school fair, which lead her to the Academy for Software Engineering. Rebecca, who attended in 2015, described her favorite course last summer, Euclidean Geometry, where they learned how to construct two circles in such a way that they formed a triangle, and they were able to prove with certainty that the shape was equilateral. 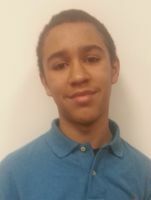 Zavier, who attended in 2011, is graduating high school and heading to SUNY Albany in the fall. Since BEAM, he has been focused on computer science, and now teaches technology at a maker space. He thanked BEAM for acting as his college guidance counselor, helping with the SAT, his FAFSA, understanding financial aid, and more. It was so wonderful to see all the 7th graders and imagine where they will be in 5 years!